There is a lot of love for African wild dogs on Safaritalk. I'm sure there must be images of dingos but a brief search hasn't found any. So with apologies I offer a few from a recent trip to Fraser Island. They are indeed a beautiful animal. thanks for posting - really special. Thank-you for the positive comments. The image above is of a pup of a few months of age - unfortunately there were 2 of these pups but no sign of an adult present. The dingo population on Fraser Island is estimated at somewhere between 180 and 220 and it is stated that the population is relatively free from cross-breeding with domestic dogs (this on the basis of DNA studies but disputed by others who have looked at the morphology of the animals). 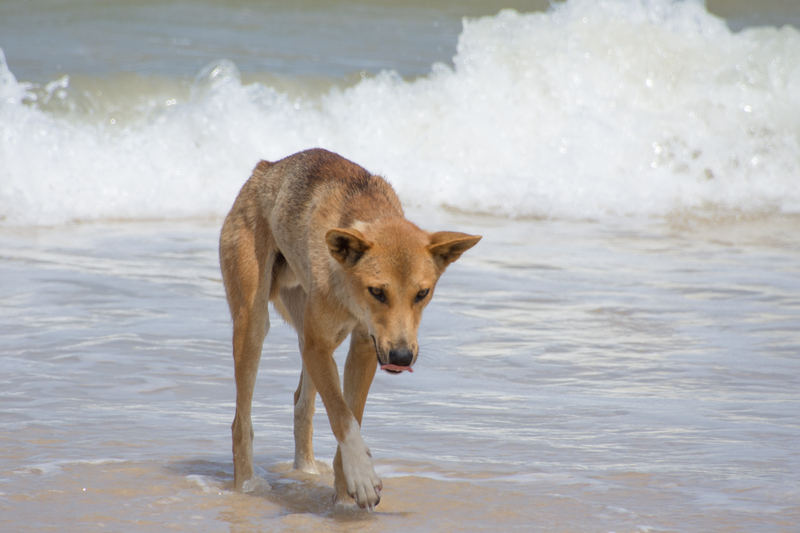 This animal was scavenging in the surf line, a major food source for dingos although they also hunt and kill a variety of mammals and reptiles either singularly or in packs. In many parts of Australia dingos are wary of humans but on Fraser Island habituation has become a problem with the animals associating human presence with food and becoming aggressive if this is not forthcoming. Together with the attrition from beach driving the relationship between humans and dingos on Fraser is complex at times. I will produce a short trip report from Fraser Island which I found to be an unexpectedly fascinating place to spend a few days.